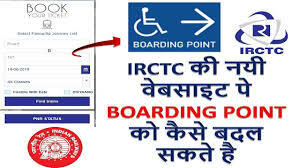 Such change boarding station on IRCTC website ...1. Log on to IRCTC's website. Use login id and password.2. Visit My Account on the new website of IRCTC. Go to My Transaction Options here in the mouse over. After this, choose the option of 'booked ticket history'. 3. After that select the ticket in which the boarding point is to be changed. You will see different options on the bottom, like PNR status, Cancel ticket and others. This is also the option of a change boarding point here. Click on it.4. After this, a pop window will open. In which will be the name of the station so that you can choose your new boarding point. This is where you change your boarding point.